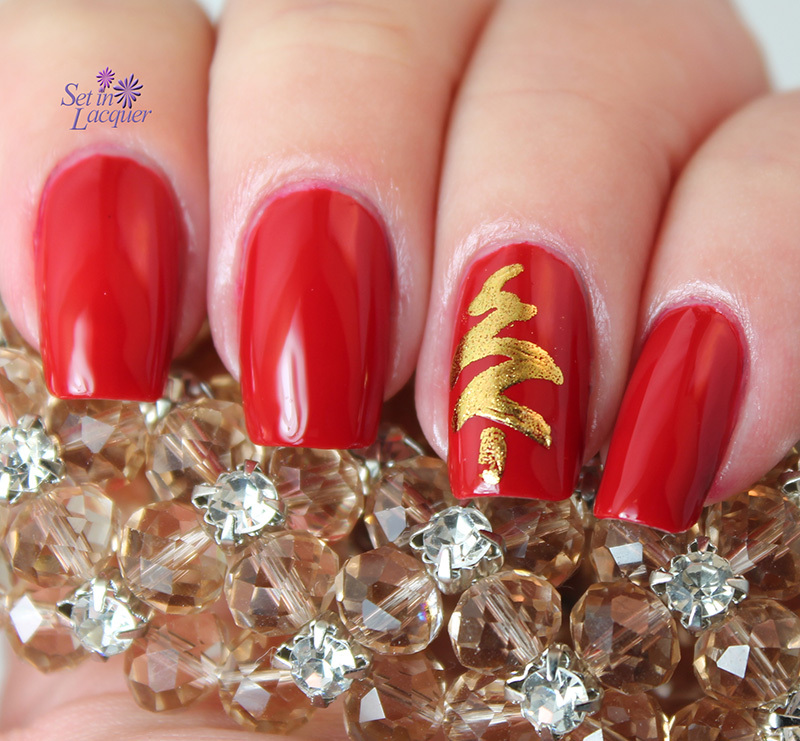 Have a polished holiday with Nail it! Magazine and Salon Perfect. 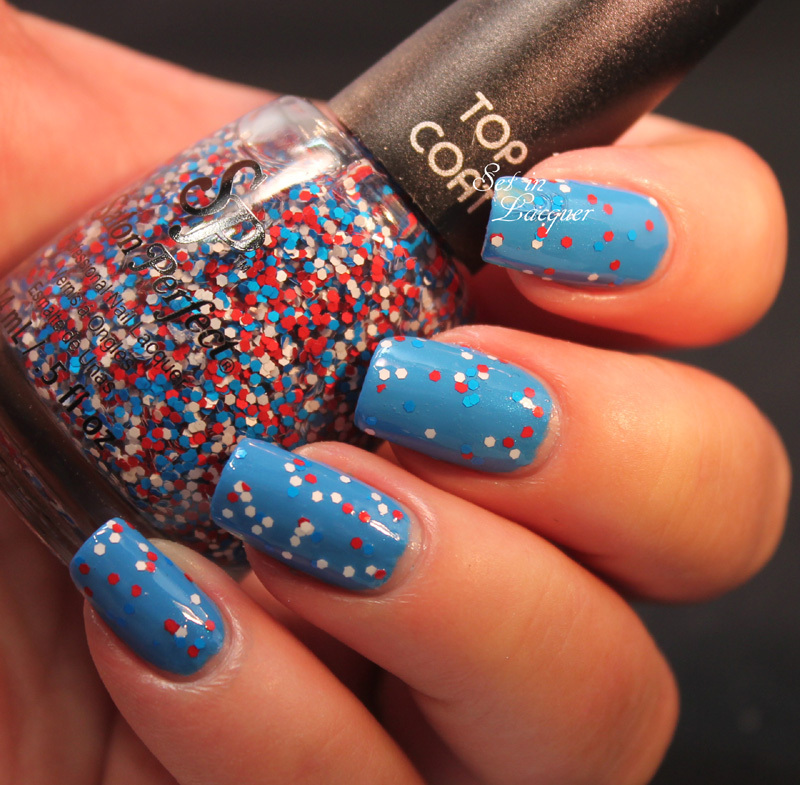 The two companies have teamed up to offer 250 lucky people this exclusive polish collection. Three of these polishes are only available through this giveaway, and the other three can be purchased in stores. That's quite the spirit of giving! Let's take a look at this collection. 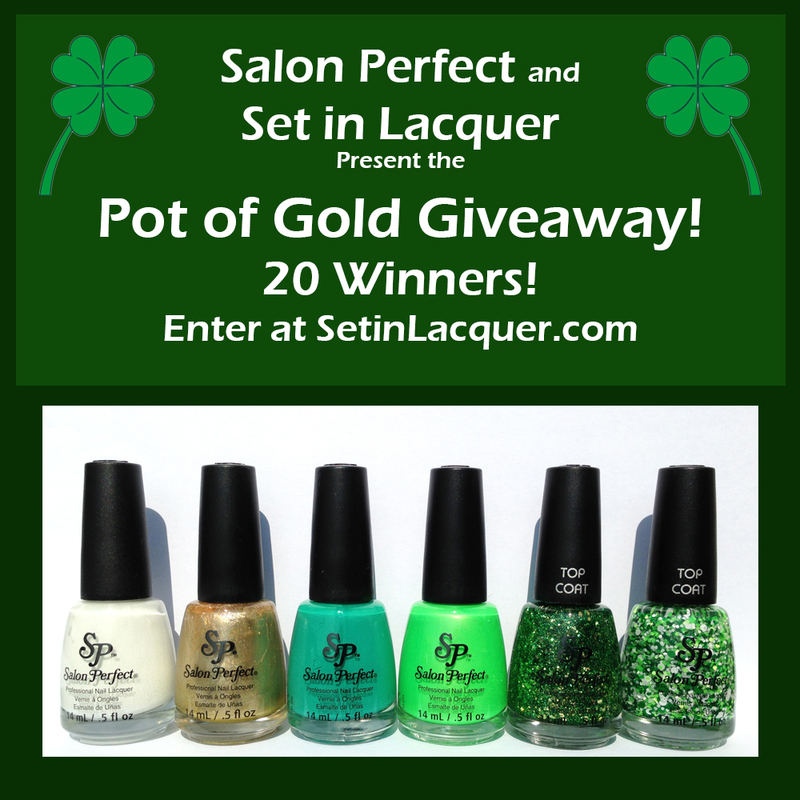 The first three polishes are exclusive to the giveway. 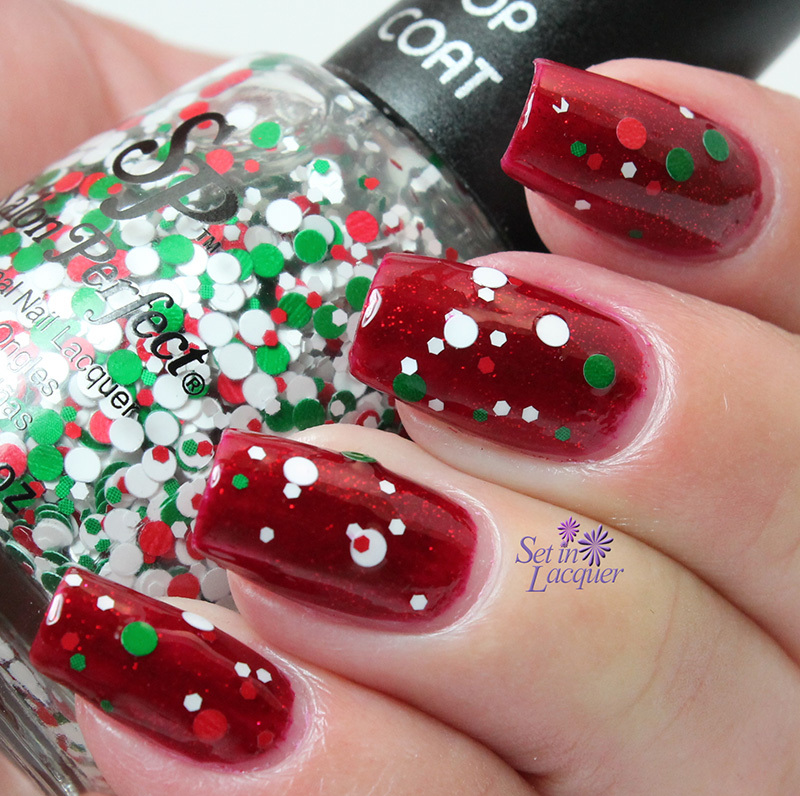 Christmas Cookie is a glitter top coat with green, white and red multi-size round glitters. 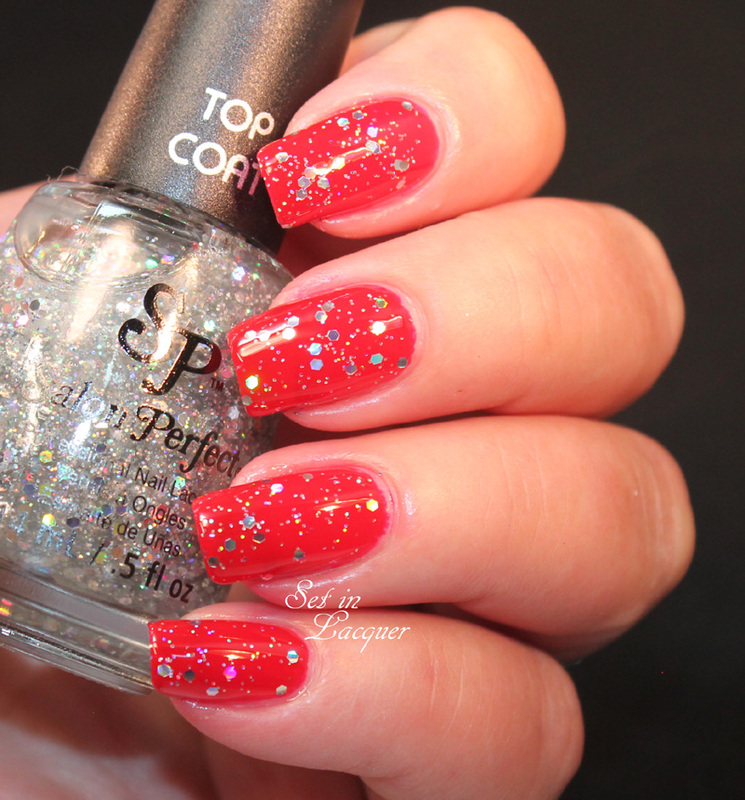 This top coat does require some glitter placement. This is applied over "He's With Me." 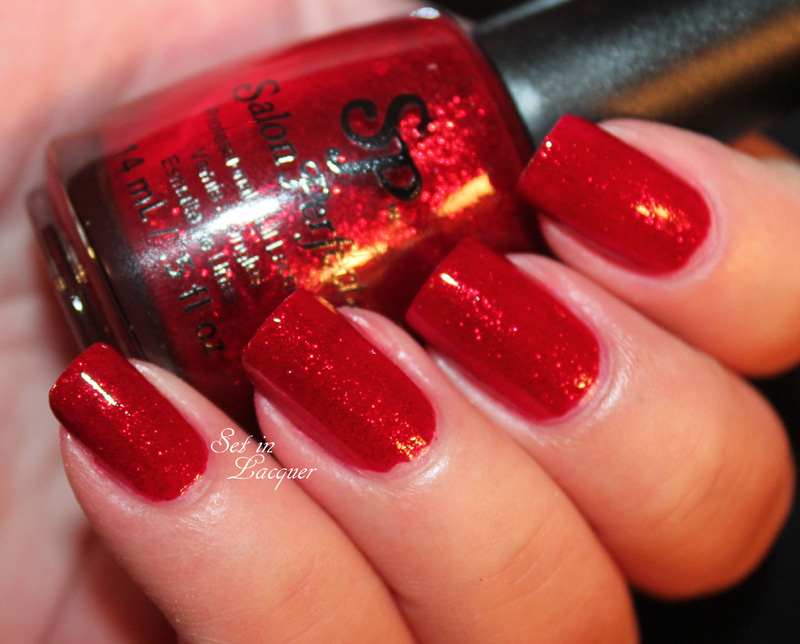 Glam Glitter is a top coat with multi-size and shape red and green glitter. It applied easily. 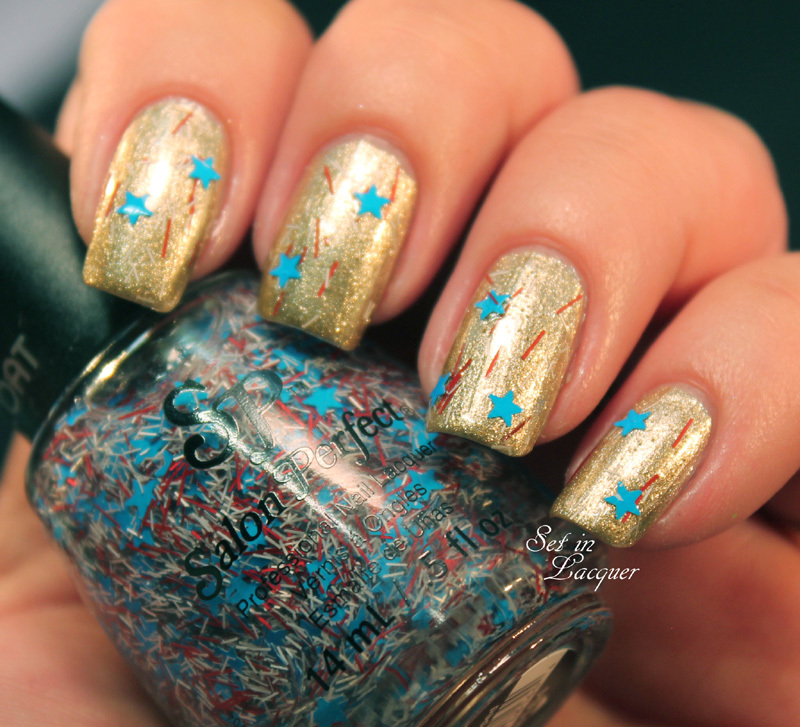 Here it is shown over two coats of "Sugar Cube," which is one of the six polishes available in the giveaway. 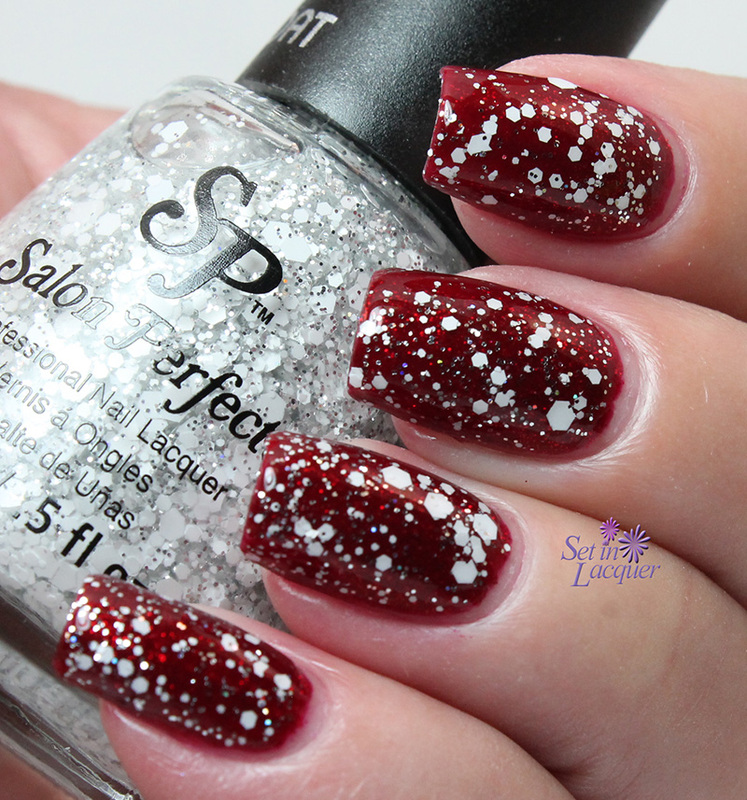 Snowed In is a stunning silver and white glitter top coat. It applied easily and evenly. It is shown here over "He's With Me." 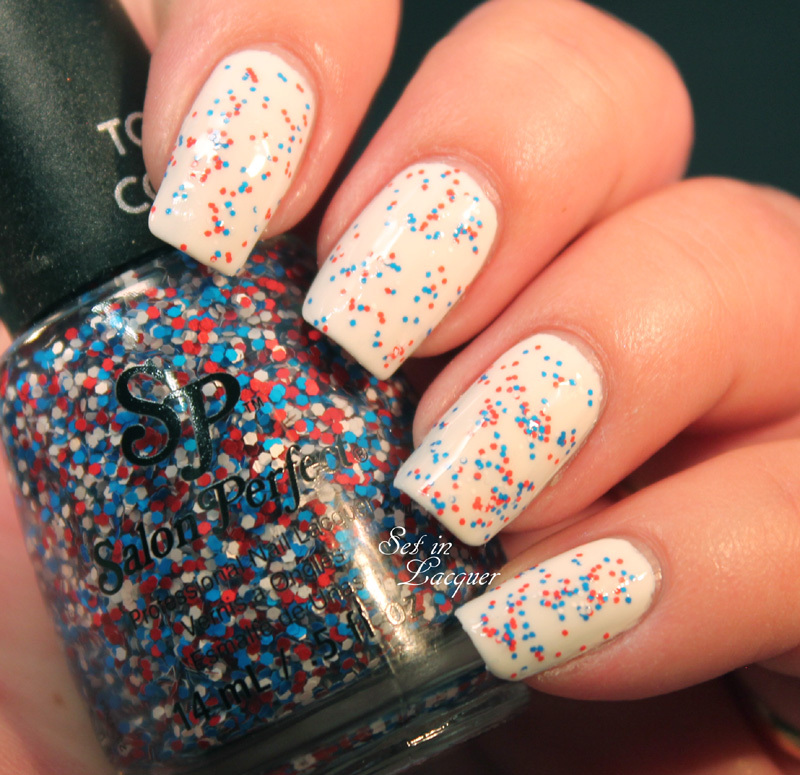 The following two polishes and Sugar Cube (a white creme polish) are available in stores. 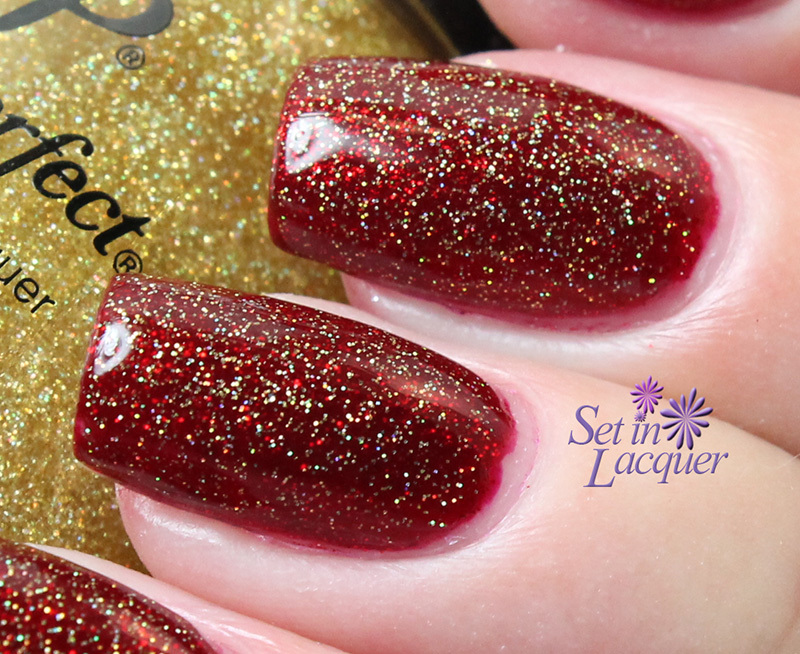 Champagne Toast is an amazing gold glitter micro-glitter that has a strong holographic tendency. I have it on here over "He's With Me." It applies amazingly well. 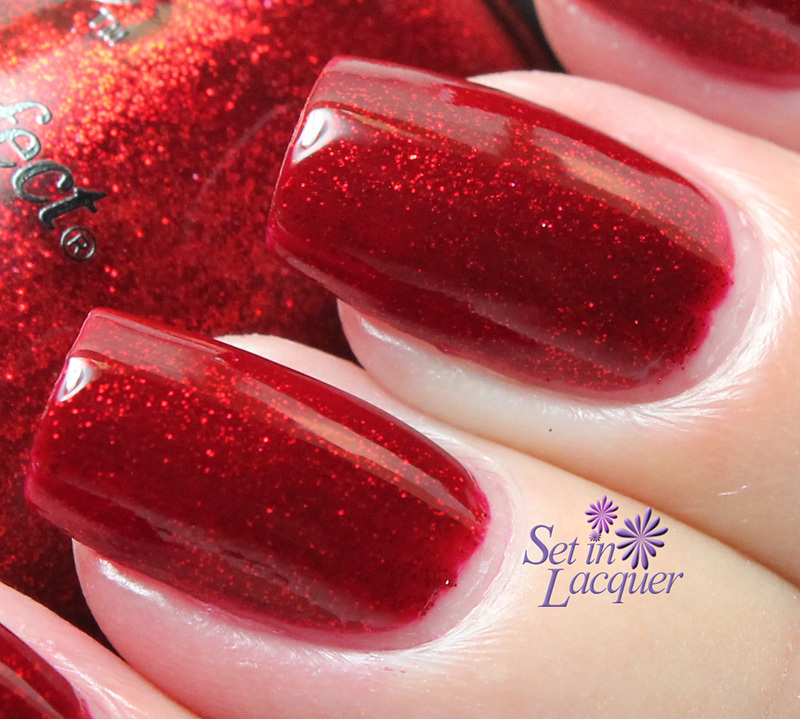 He's With Me is a gorgeous and vibrant red with inner micro-glitter that appears to be lit from within. This is a stunner. 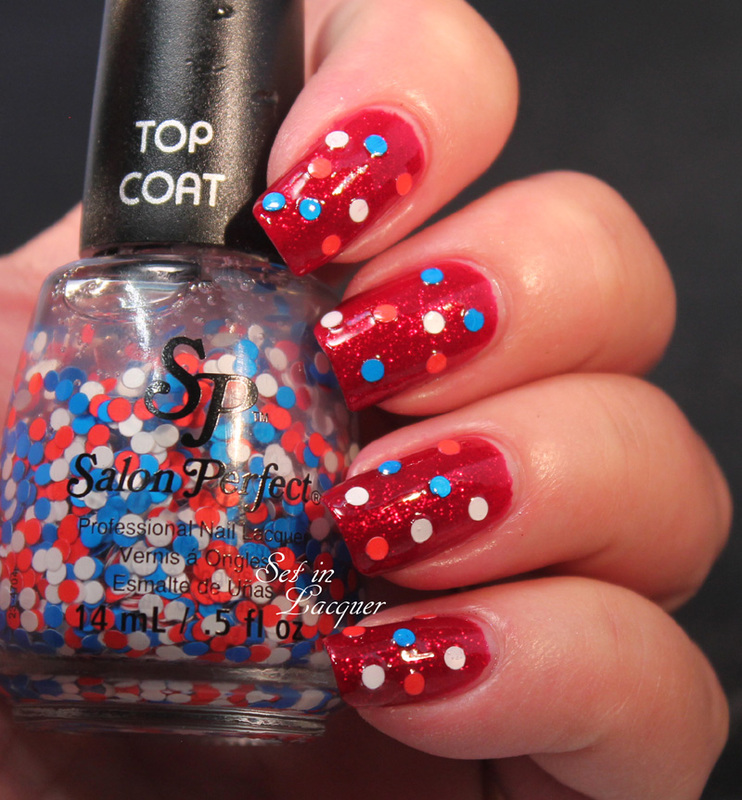 This is two coats with a top coat. 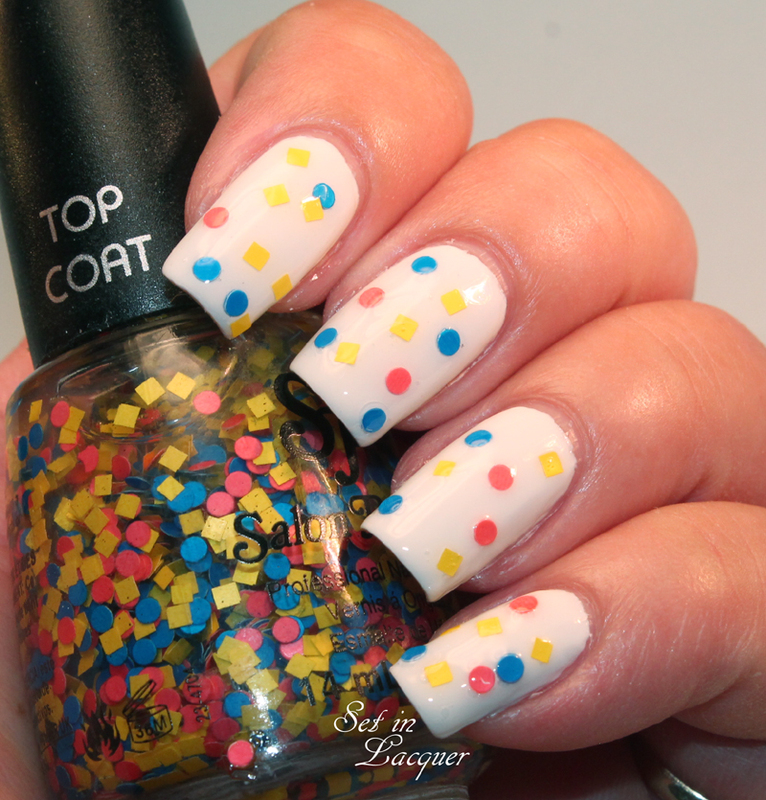 You can win this entire collection from Nail It! Magazine, if you enter before November 30th. 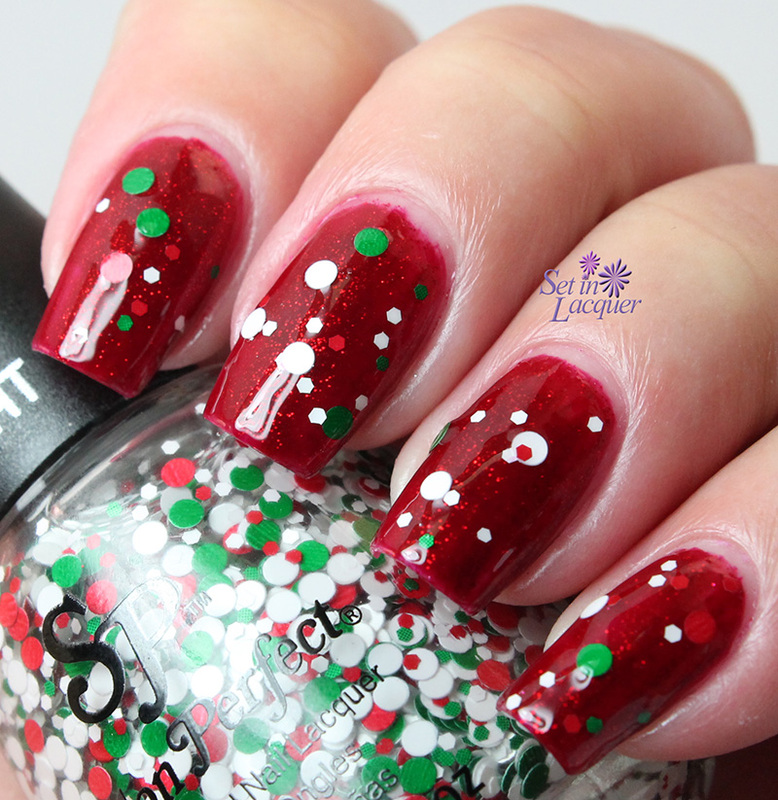 Christmas Cookie, Snowed In and Glam Glitter were exclusively made for for this giveaway! They're giving away 250 sets between now and November 30th! Good luck and make sure to enter at NailItMag.com for your chance to win! 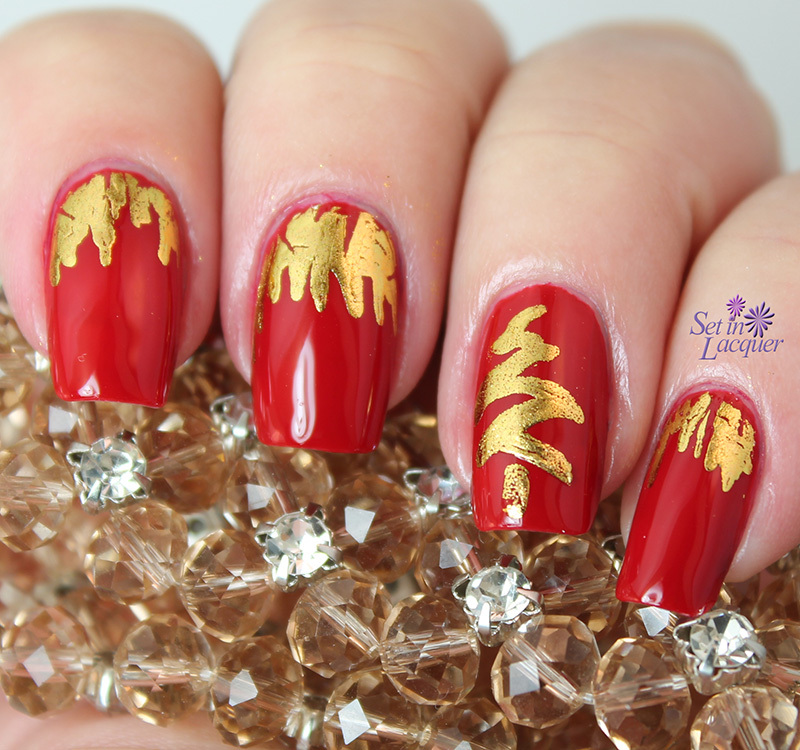 I often browse Pinterest to get inspiration for creating nail art. While scrolling through the photos last night, I spotted a neon flame nail art look from +Robin Moses and decided to try and recreate it. First, let me say that I am happy with the end result - but I am no Robin Moses. She makes it all look so easy! I started with a base color of Zoya Raven and then followed the steps she explained on her video. The only thing I changed was the yellow tint. +Salon Perfect Wowza Yellow worked well without thinning it down. The blues and greens you see are acrylic paint and the holographic glitter is some loose microglitter I use for adding to polish or using as an accent in nail art. 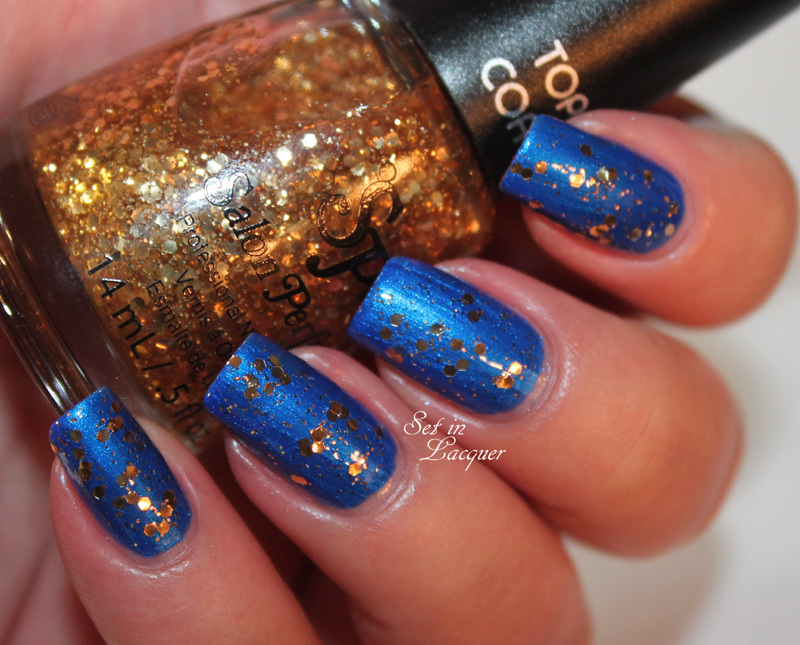 This look was relatively easy to create. If I had to do it again, I would make the base of the flames a little wider - OK, a lot wider. Mine look a little wimpy. But overall I am pleased with the look and wouldn't change anything. Is this look something you would try? Most of the products in the post were purchased by me and some were sent for an honest review. All opinions are my own. 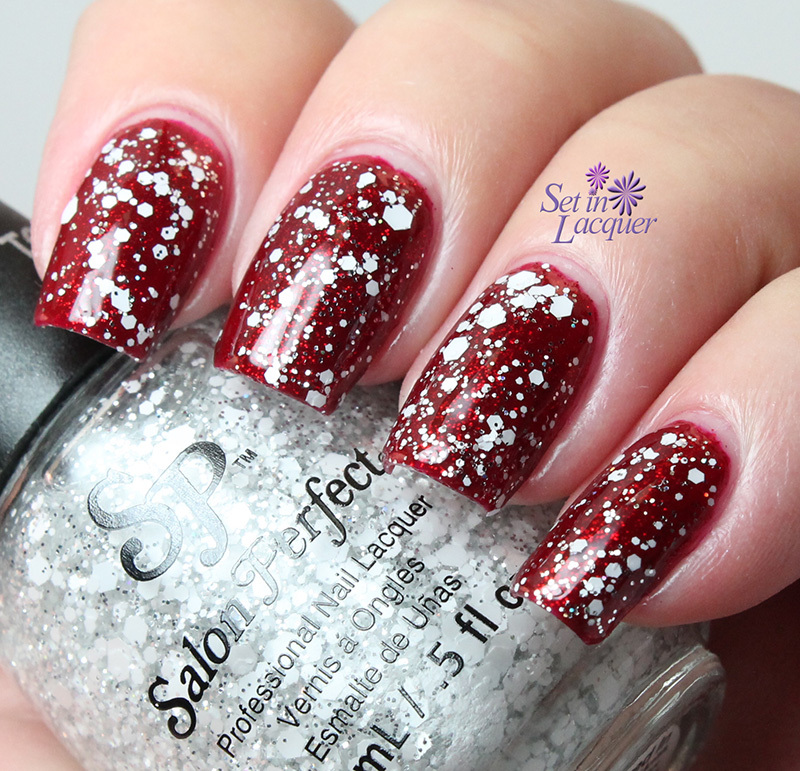 Salon Perfect has been oh-so-busy lately. 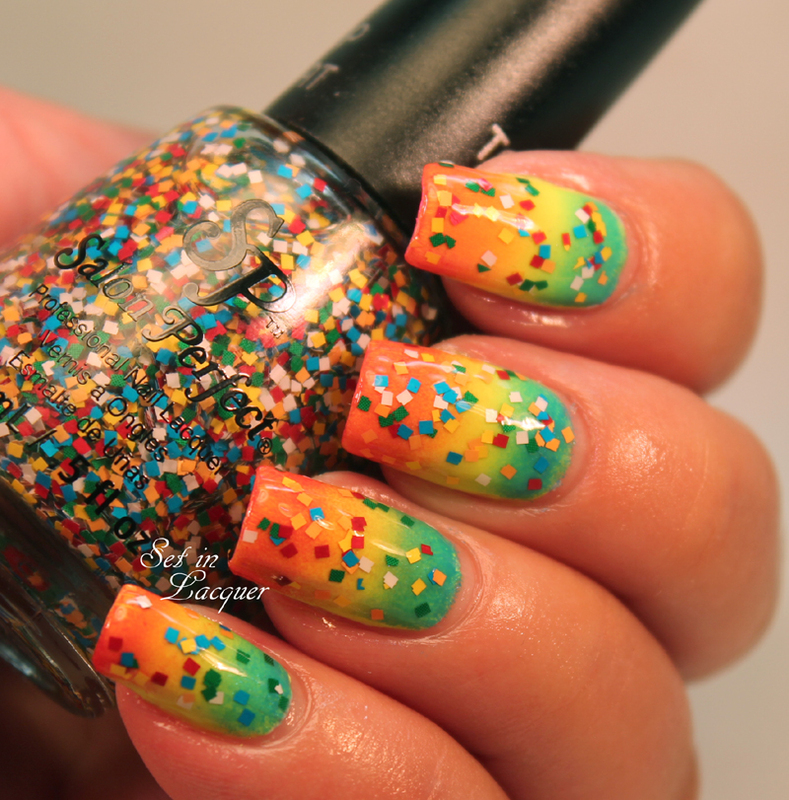 They have released an amazing collection of neon polishes - Neon POP! I will be swatching these to share with you. 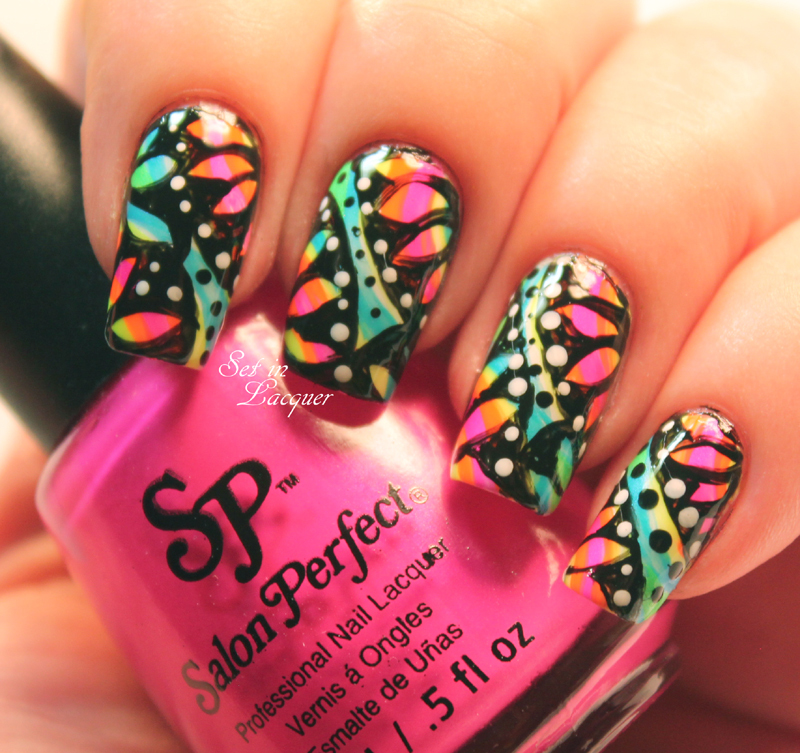 But first, I just had to create some nail art with these vivid polishes. 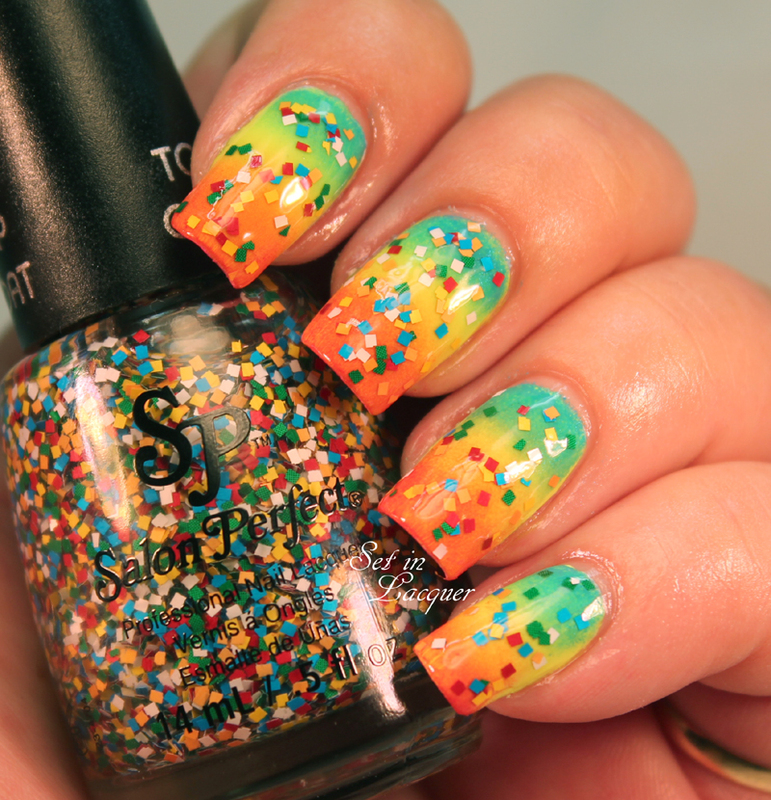 Neon polishes just scream for fun nail art. 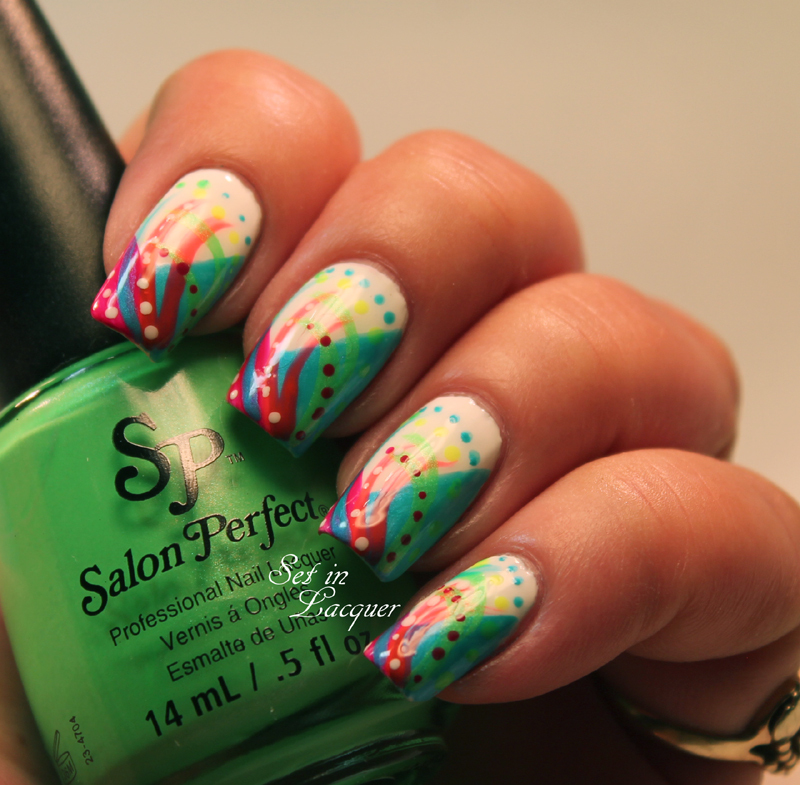 I think the hardest part of nail art is actually choosing an idea. I scoured the net for ideas and came up with a couple. One of them I like so much I am going to have to recreate it... with a couple of fixes of course. For this look, I took inspiration from Robin Moses. I loved how the neons look next to black. 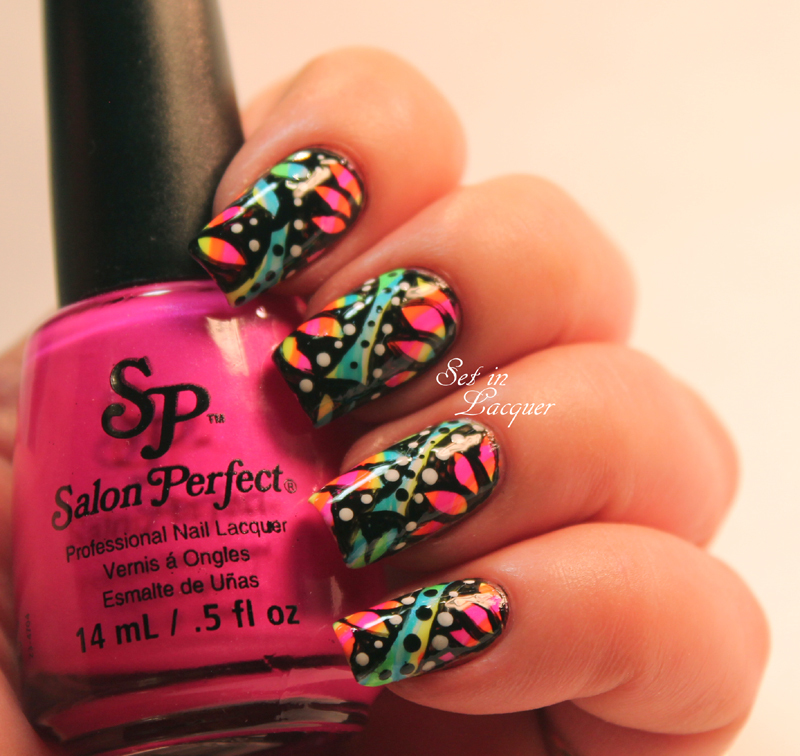 I should have made the flower petals larger to show more of the neon stripes. But I will next time. 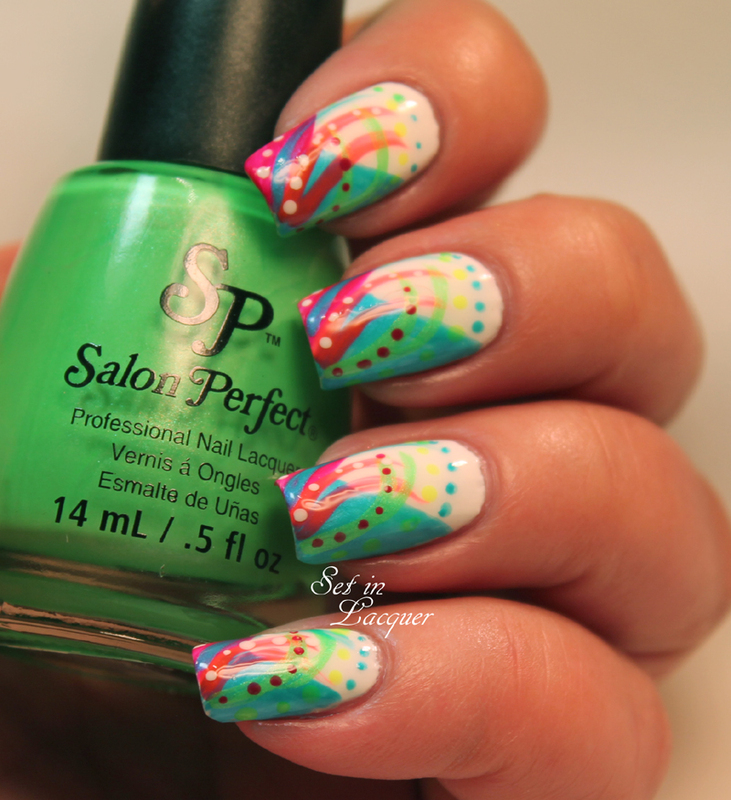 I started off with Salon Perfect Sugar Cube. It's a pure white cream and the white makes the neon POP even more. Then I used Salon Perfect Bermuda Baby, Yowza Yellow, Loopy Lime, Fired up Fuchsia, and Traffic Cone to create neon stripes. 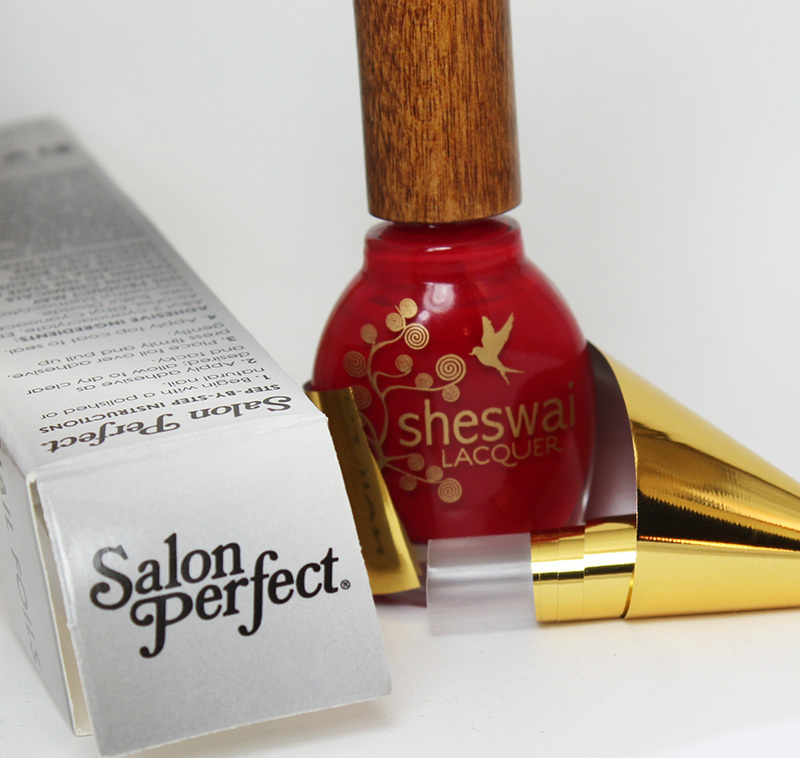 Then using Salon Perfect Oil Slick. I painted the outline of the flower petals and painted in around the petals. 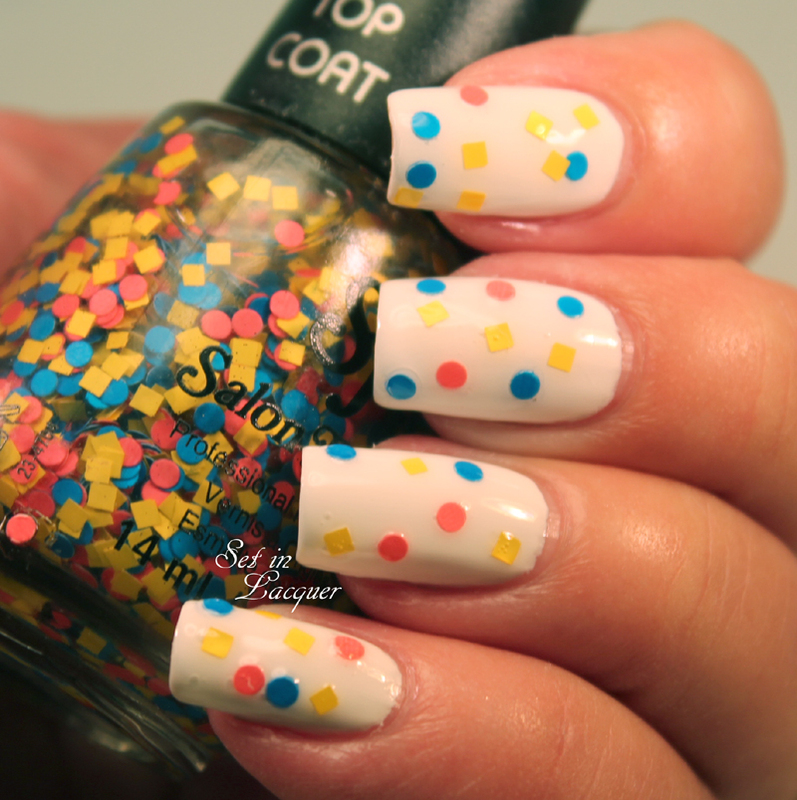 I used a dotting tool to add white and black random dots. 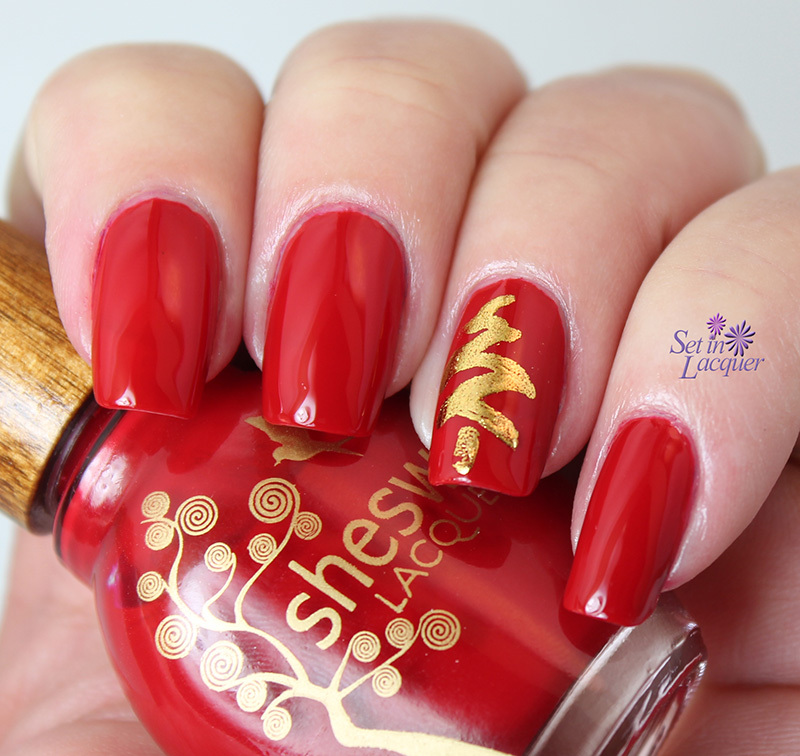 I added a top coat and had an instant, vibrant and dramatic nail art look! For the second look, I decided to create a softer look. 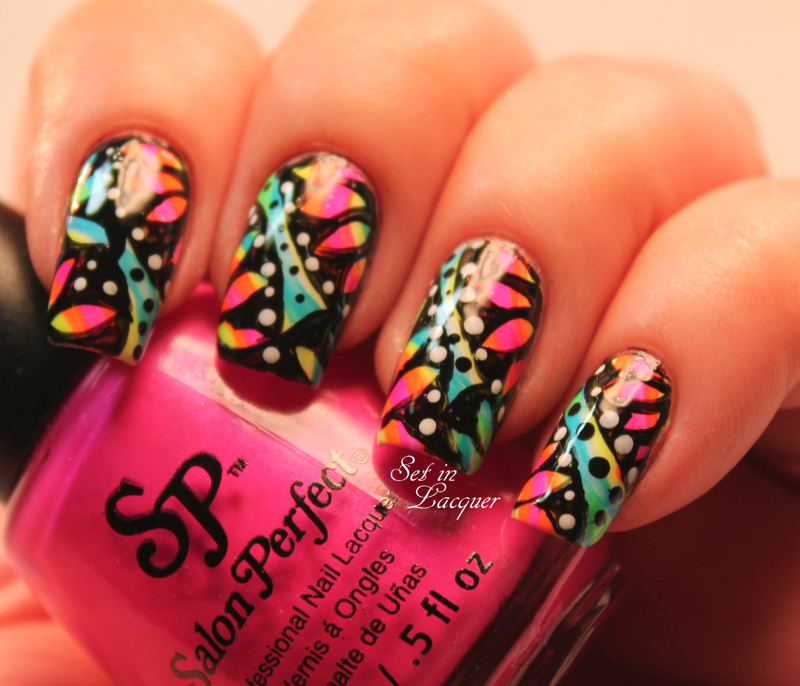 But I still wanted it to have the vibrancy of the neon shades. Once again, I started with a base color of Sugar Cube. Then I used Bermuda Baby, Yowza Yellow, Loopy Lime, Fired up Fuchsia, Plum Sorbet and Traffic Cone to add random shapes, stripes and dots. Watch for individual swatches coming up soon! Available now at Walmart stores nationwide for just $3.98 each, these high-voltage shades are must-haves for summer.